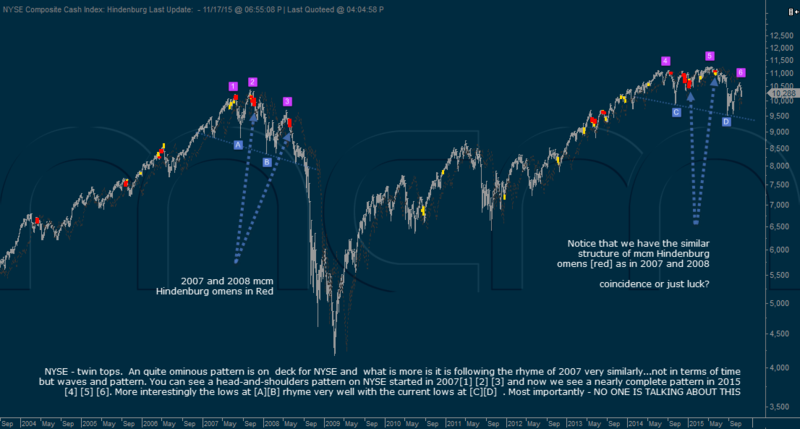 Particularly Grave Setup in NYSE – Fly In the Ointment or Ointment on the Fly? Earlier today, we mentioned the grave set up occurring on the NYSE. Almost all analysts seem to be missing this, especially most wave analysts. 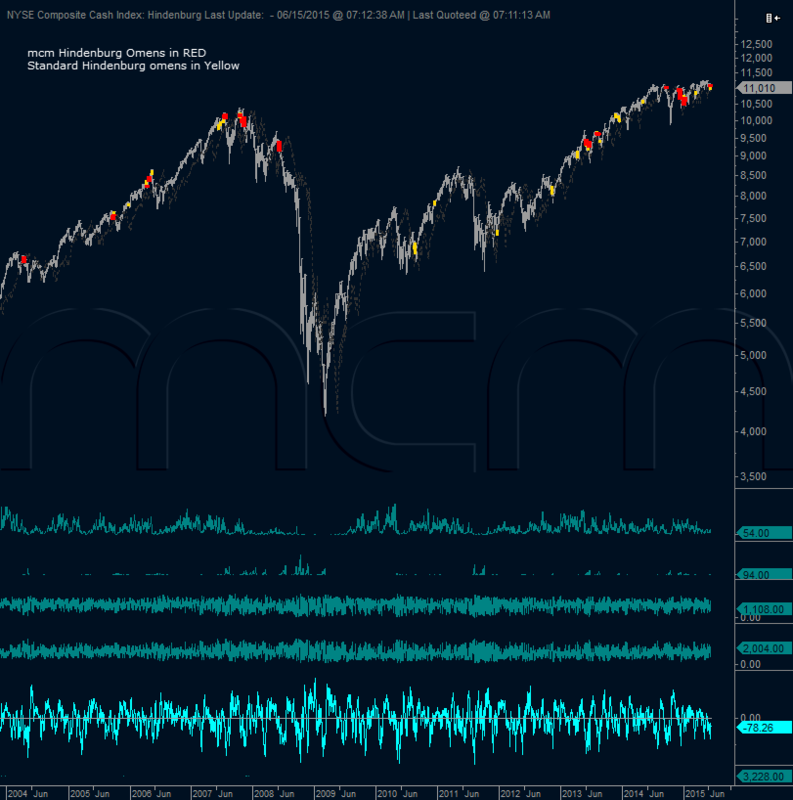 The reality is that we have a succession of three clusters of MCM Hindenburg omen's, all of which marked major turns within the recent market structure. 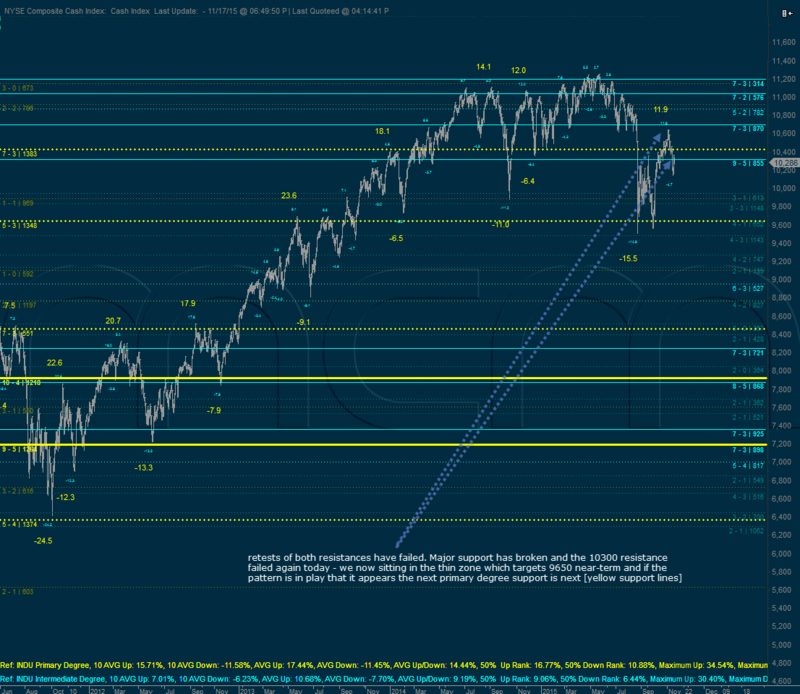 This is nearly the identical set up as what occurred in 2007 and 2008. We are not Hindenburg Omen enthusiasts, the MCM Hindenburg is another matter entirely and is extremely bearish accurate and very rare. The MCM Hindenburg Omen shares one thing in common with normal Hindenburg's: "Clusters of them should be interpreted as being dangerous". We have a particularly large cluster and particularly ominous pattern. 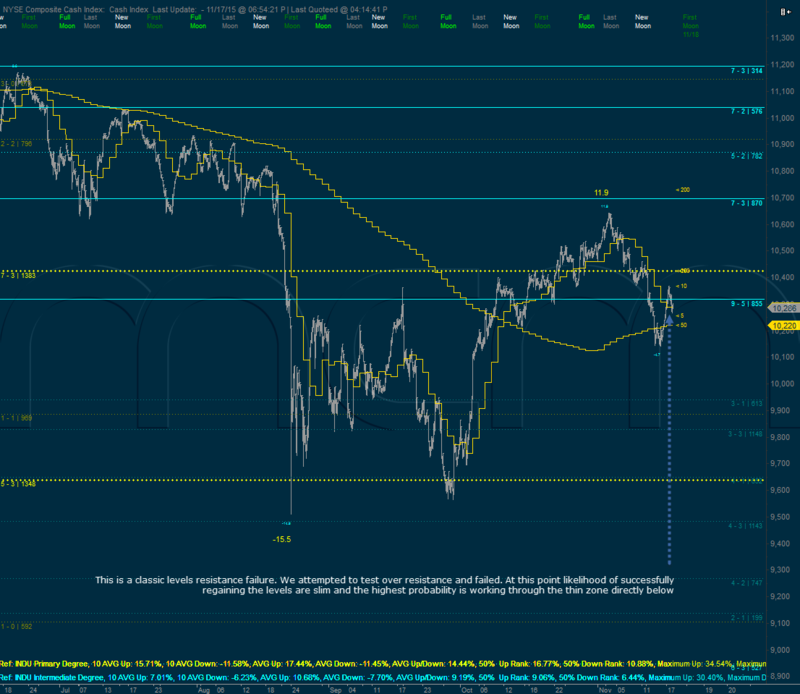 Additionally today, the NYSE attempted to break over a previous levels chart resistance. It failed on this attempt. Action like this is symbolic of failure to recapture a previously broken support, which became resistance and which is now resistance again in a more significant way since we have fallen beneath it again. While it is possible to be recaptured but it is not necessarily the greatest odds, however, if it is recaptured and especially if we break above the yellow primary degree resistance at 10430 or so - that is a good warning that the up move may be extending. This exposes the meat of the thin zone, which targets a significant drop if it were to be filled. As can be seen from history on this chart, thin zones are usually filled in quickly and accurate. 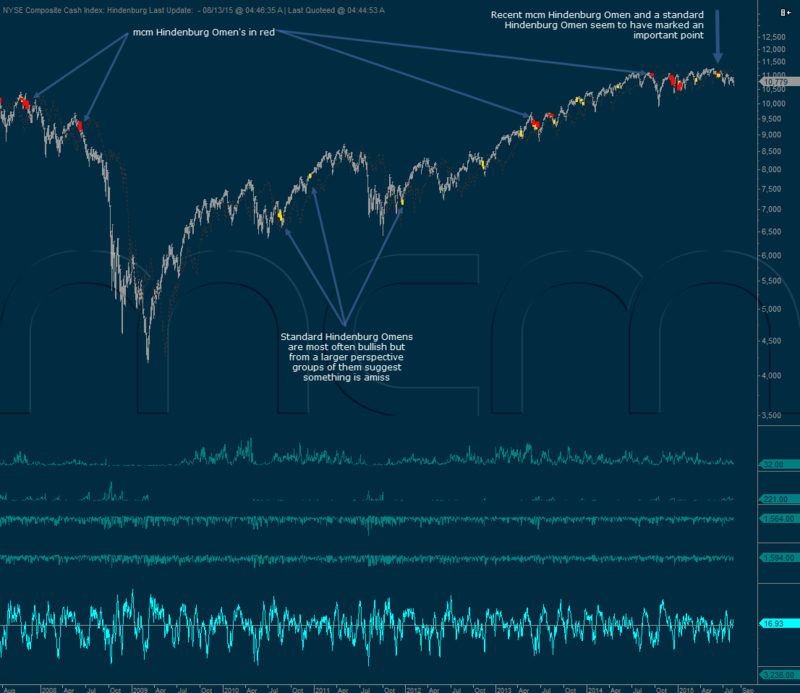 To significant effect market behavior has significantly changed since the last mcm Hindenburg Omen. This could be a lasting negative or with the very low-quality action on the markets now generate another Omen into September. Either way this chart deserves some respect - the RED marks on this chart are mcm Hindenburg Omens. Notably a cluster of RED triggers is something to be concerned about since these are very difficult to trigger and much more sophisticated than a standard Hindenburg Omen. We will post updates if anything new transpires - but currently this current omen is still in effect and currently working. Last week we posted our proprietary mcm Hindenburg Omen event. We find Hindenburg Omens only of anecdotal and entertainment value. HOWEVER, the mcm Hindenburg Omen has SERIOUS implications. This does not mean the market crashes - though it could. However, every time except the last triggers in early January this year a decline of greater than 6% has occurred. It is much more precise and difficult to trigger. We also have an mcm Wright Bros Omen (seriously) that is pretty much the opposite of the mcm Hindenburg Omen - though we have not settled on a name...suggestions welcome. In any case, this post shows a lengthy history for perspective and for your research on this type data. Below are the images. The historical images are very large: if the images to NOT Open full size for you right-click on them and choose "open image in new window or tab" to see at full resolution.